If you are like me, you profess every New Year that you are going to make changes… Well it is almost February, and I haven’t even started to make any changes yet. When you decide to make these changes you usually do not take into consideration that figuring out what steps to take next can be so overwhelming, you quit before you start. For example, every year somewhere on my list is to be healthier (I am sure like many of you), but more often than not, sifting through all of the diets and exercise programs out there overwhelms me, and I just continue with my same routine. The Robert Half Technology Salary Guide 2011 has found the most in demand job titles, skill sets, and certifications for the coming year. If you are looking to change careers or add to your skill set you need to read this to make sure you are looking at career paths that are in demand. There will be high demand for application developers, .NET developers, systems administrators, database administrators and desktop support professionals. In demand skill sets for the coming year include; programming , business mindset, technological proficiency, security, networking, infrastructure support, and electronic medical records. Certifications in demand- Cisco certifications (Cisco Certified Network Associate), Linux (Red Hat Certified Engineer), Microsoft certifications (Microsoft Certified Applications Developer, Microsoft Certified IT Professional, Microsoft Certified Systems Engineer, and Microsoft Certified Technology Specialist), Project Management Professional (PMP), and Security certifications (Certified Information Systems Security Professional, Check Point Certified Security Administrator, and Check Point Certified Security Expert). 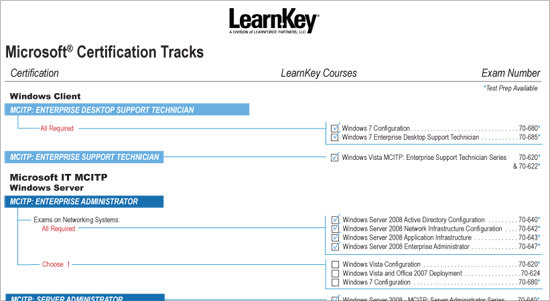 Check out the training LearnKey has available to help you get certified! 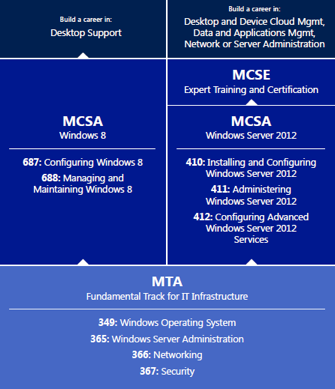 The numbers above may seem cryptic to some, but those familiar with Microsoft’s Certification Exams will likely recognize the format. This particular combination of numbers refers to the most recent Windows 7 exam. : TS Windows 7 Configuring. This is the nuts and bolts. How to install, deploy, and upgrade to Windows 7; how to use existing hardware to connect, maintain, recover and functionally use Windows 7 in a network environment, and how to check for compatibility in place upgraded hardware is required. Useful information for anyone from a home network enthusiast, to a network admin, the certification itself and skills neccessary to use Windows 7 effectively are geared specifically towards IT professionals.